I have to say, that the Japanese 12-2 weave is my favourite chain maille weave of all time. There is so much fascinating variation with it that the possibilities really are endless. 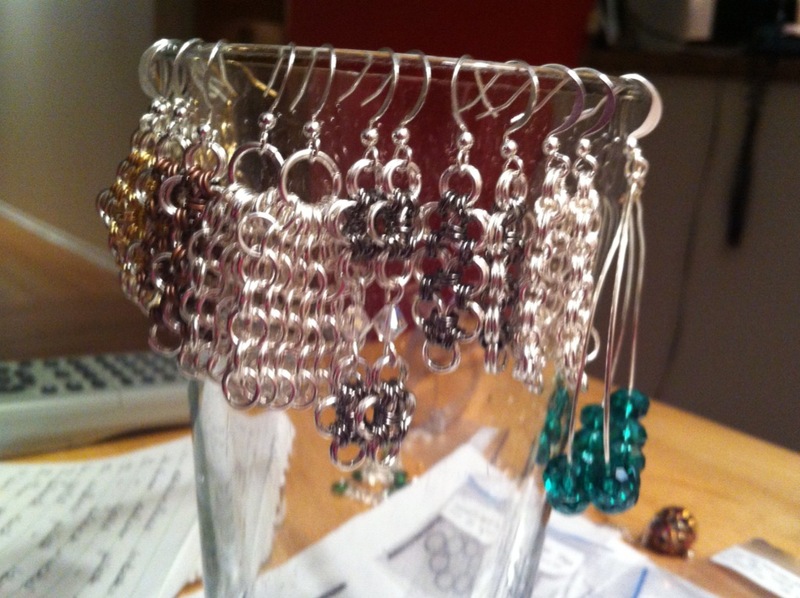 So in preparation of this weekends craft show, I decided to re-think my earring offerings. 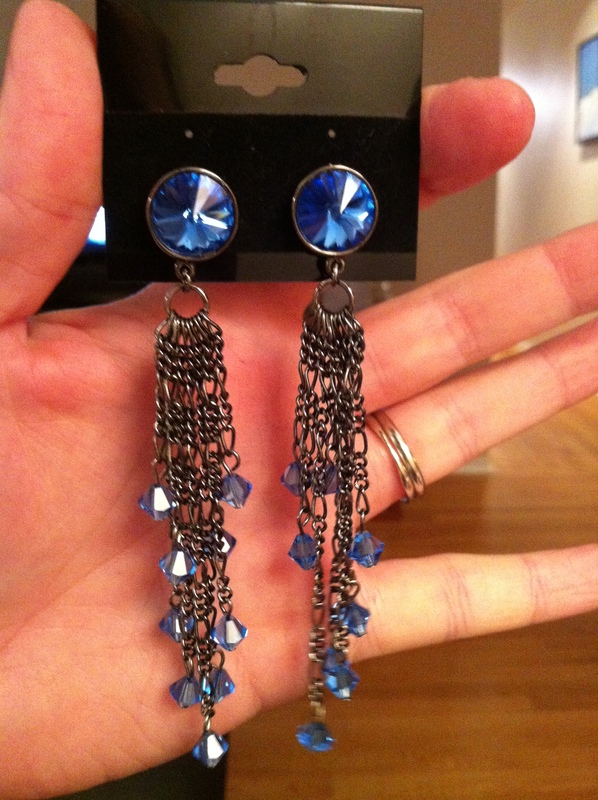 I will still have my sterling silver birthstone crystal earrings, and my fancy chandeliers, but instead of simple beaded earrings, I will be offering more chain maille. Last night I made a number of variations of the 12-2 in various colours. I also tried out the European 4-1 fan, which I really REALLY like! 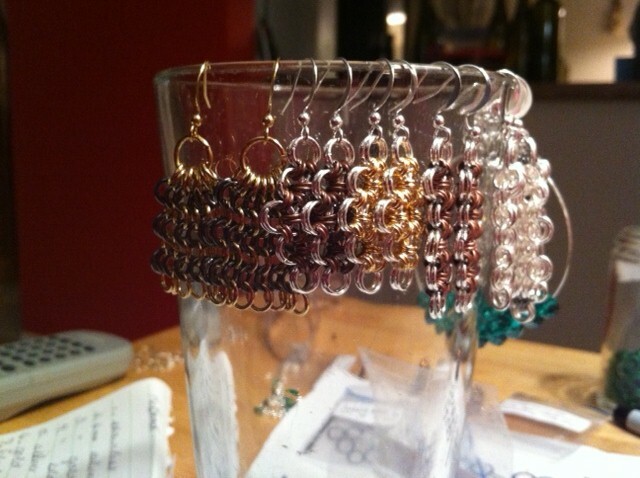 All in all I made 9 pairs of earrings. I worked almost entirely with base metals in your standard, gold and silver plate, black nickel and antique copper. 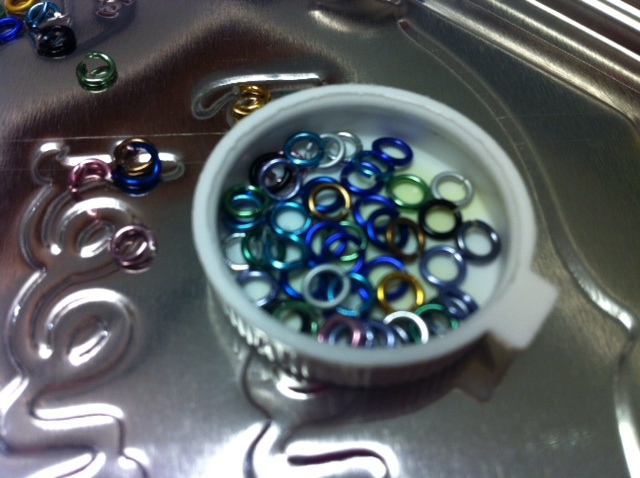 However, I also have 4mm rings in anodized aluminum that I am looking forward to trying out. I also have my thicker anodized aluminum rings that I am going to try out the 4-1 fan with. Only 3 more evenings to prepare everything for the show! Tonight my husband is going to help me set up the cubes and attach the hooks for the bracelets. I also have to print up my sign and price and card all the new items. I always say, there is no inspiration like last-minute panic! (originally quoted from Calvin and Hobbes). 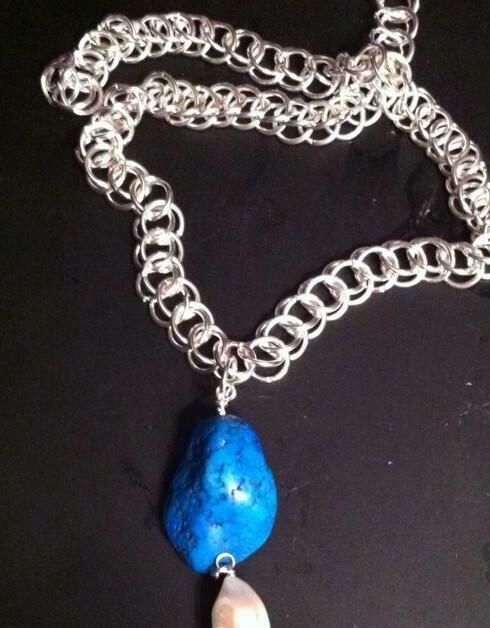 Craft Shows, Display Cases and Frustrating Chain Maille Weaves. First of all, today is Remembrance Day, and though my office is open today, being downtown Ottawa I made sure to visit the Cenotaph at lunch to lay my poppy on the grave of the unknown soldier. It is a good to reflect on the sacrifices made by our service men and women throughout history and give them our thanks. it’s been a busy few weeks. 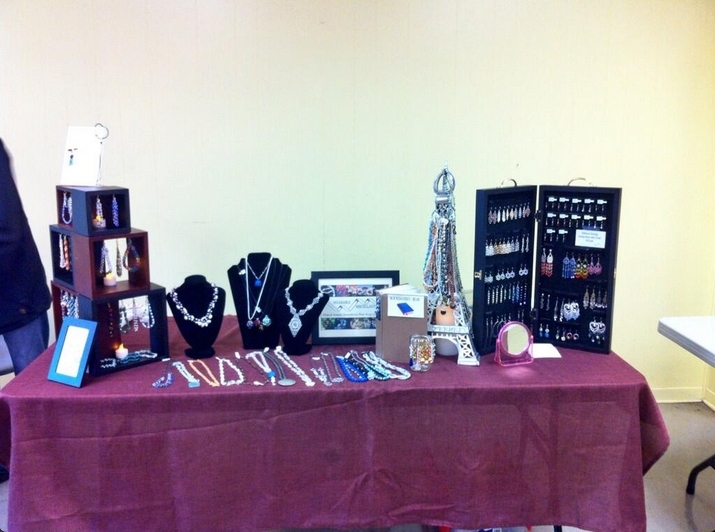 I made it through my first craft show on November 2nd. What a day! it began Friday night with taking my gear over to Meghan’s house and helping her load up her car with all the displays for the booth. She really goes all out it is very impressive! Meghan picked me up at 6:30am and after whipping through the Tim Horton’s drive through we made it to Kanata by 7. We found our table and then set up. We finished well before 9am when the doors opened. Our booth looked fantastic! As for my sales, well, certainly NOT fantastic. I sold about 5 items, so not bad for a first showing. Still there is something really quite demoralizing about seeing people look at something you have made, something that you are proud of, that was a lot of work, and pass it over. I suppose it must be the same for any crafter. I tried to stay positive but it was difficult at times. Still, there is something equally wonderful about someone picking up one of your pieces and deciding that it is exactly what they are looking for. That is a great feeling! When I finally arrived home at about 5pm, I made it as far as the couch before I passed out for a couple of hours. The other thing I am rather proud of that happened in the last few weeks is that I finally mastered Half Persian 3-1 weave. Oh, My, Freaking, Goodness but it is frustrating! I used to know it, but somehow had forgotten and it is one of those weaves that can very easily go wrong. It is a matter of keeping a firm hold on the rings in just the right configuration until the pattern stabilizes, and even then, ring placement can be tricky. There are lots of different videos on YouTube with different tutorials, but I did finally manage to find one that worked for me. Either way, I am quite pleased with the results and pretty sure I can pick it up again any time. 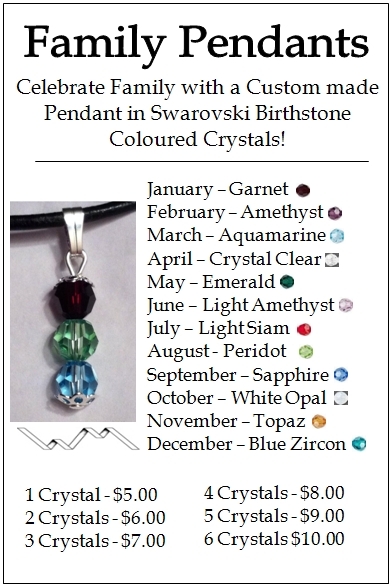 This coming weekend the 16th of November I will be at another local craft fair. This time at the Trend-Arlington Community Centre, Ottawa South. I have the table to myself this time so I have had to give a lot of thought to how I want to display my work, given that I don’t have a large number of displays already. What I do have is a very handy husband who made me an excellent display case for earrings out of two picture frames, that folds up with a latch and handles so I can carry it without having to load and unload the earrings. As for displaying bracelets, I found these cube shelves that my husband had in his condo the smallest about 6 inches square and the largest, maybe 12, and I thought, hmmmm. I also have, that I had forgotten about, a nearly identical set in dark brown, that are just a little deeper than the black ones. So what we have decided to do is attach a number of small brass tea-cup hooks to them and then we will use temporary two-sided mounting tape to hold them in a pattern that works with the table (which will have to wait until I see it on Saturday). This way we can display my bracelet collection! I also found a non-decorative use for my big (although smaller than the original) silver Eiffel Tower. It stands about two feet high and very conveniently, I can hang a whole bunch of necklaces from it using small metal “S” hooks. So right now my dining room table has been given over to practice set up. I will make sure I get a picture of the booth on Saturday. Well, till next time folks.